This, then, is the Book of Lost Hours. Long thought lost from mortal eyes, but recently recovered in shipment of other artifacts from Antarctica. 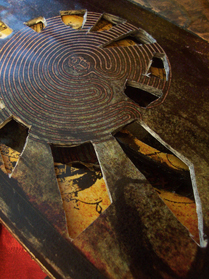 None know where or when the Book first came- it's language and markings are as yet, undeciphered. Its purpose as well, is unknown- some argue that the twelve sections or hours of the book make up an oracle- a living tarot deck in bound form. Others argue that the book itself is a prophecy of unknown origins, and that the clock cunningly worked into it exists to count the hours remaining until its dread completion. 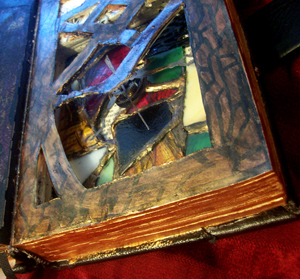 The tome has been compared to the Necronomicon, The Book of Dyzan,and other strange volumes as one of the truly great and mysterious tomes of this, or any, age. 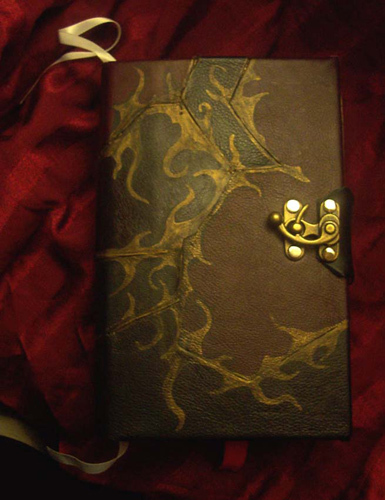 The cover, as can be seen, is made from scraps of various leathers and unknown hides, detailed in faded brass. 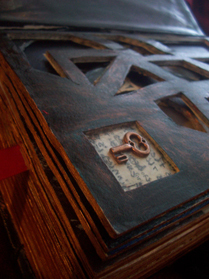 The Book of Lost Hours is available for private sale or for public gallery showings. If you're interested in either, please contact us.